Okay maybe not – but these cookies are swoonworthy – and definitely packed with flavor. 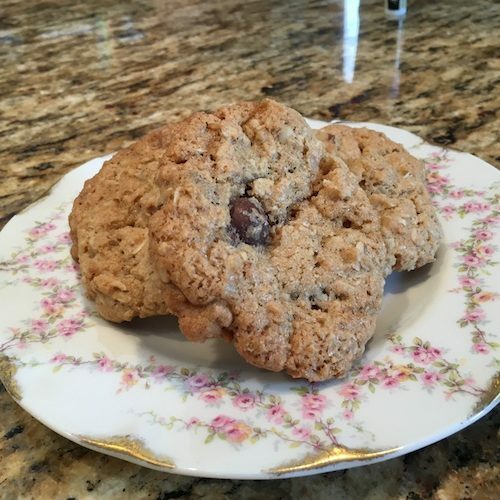 I like that they use old-fashioned oats – I think they hold up better, they don’t “dissolve” into the cookie – which means a better oatmeal-cookie-texture. Use semi-sweet chips if you prefer, but I’m a dark chocolate fan for sure. They get a little crunchy and a little soft – great for lunchboxes, holiday gifts or dunking…or all three. I have a 3/4″ cookie scoop, and although it’s technically a uni-tasker – its a must-have in my kitchen. Using teaspoons to put cookies on a tray is old-school – and it works fine, but I never had look ending up with uniform size cookies. 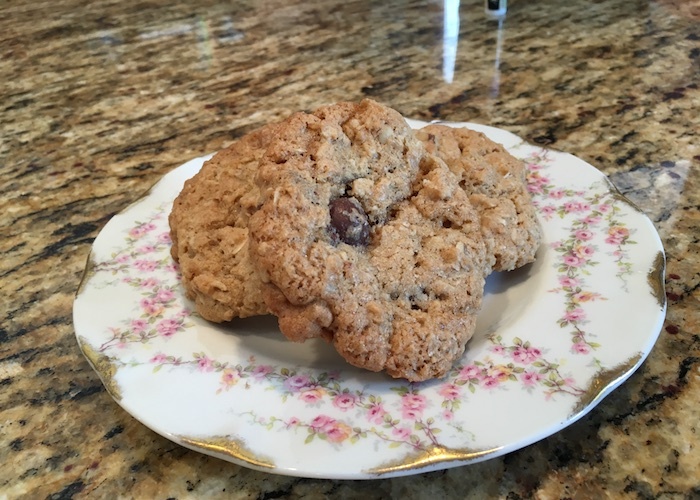 I hope you like these – they’re so much better than oatmeal raisin cookies – which are gross – and just one reason to have trust issues. Raisins are ick. Move racks to middle of oven & preheat 375, line 2 baking sheets with parchment. Beat butter, brown sugar, white sugar together until creamy - then beat in eggs and vanilla. Fold in oats 1/2 C at a time until evenly mixed, then fold in chocolate chips and nuts. Use your 1/2 to 3/4" cookie scoop (or 2 teaspoons) to drop spoonfuls onto your parchment lined sheets. Bake for 10 minutes, then swap trays, top to bottom and bottom to top, then bake for 4-5 more minutes. Cool on newspaper and then store in a sealed container or zip bag.